Effective against hyperlipidaemia and hypercholesterolaemia. Used in the prevention of diabetes, cardiovascular disease and Alzheimer’s disease. 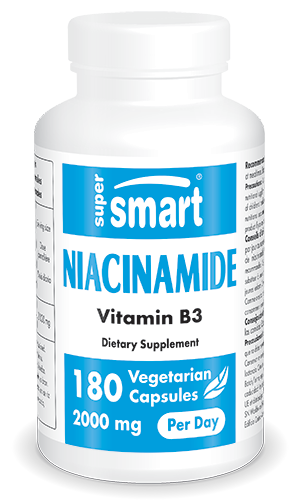 Niacinamide, or nicotinamide, is one of two forms of vitamin B3, the other being niacin. Niacinamide is essential for hundreds of enzymatic reactions; research has shown its benefits in arthritis, asthma, diabetes, cardiovascular disease, stress and stroke. helps stabilize the ATP/ADP ratio in the brain, and as a result, energy levels. Gene therapy research has also increased interest in niacinamide: a gene promoting longevity called Sir2 (silent information regulator 2) produces a protein, Sir2p, which extends the lifespan of cells. It controls the rate of cell ageing by regulating production of genetic waste products' the accumulation of which destroys the cell. This protein is dependent for its activity on the intracellular presence of nicotinamide-adenine-dinucleotide (NAD). Niacinamide supplementation helps to directly increase intracellular NAD levels and thus the activity of the anti-ageing protein Sir2p. Niacinamide is thus emerging as a first-generation tool in anti-ageing gene therapy. This safe, effective and inexpensive nutrient represents an essential element of your anti-ageing programme. Other ingredients: silicon dioxide, magnesium stearate, cellulose. Each vegetarian capsule contains 500 mg of niacinamide. Take three or four capsules a day with meals.